National Flip Flop Day is on Friday, June 16, 2017, which is Tropical Smoothie Cafe’s own holiday that occurs on every third Friday in June. 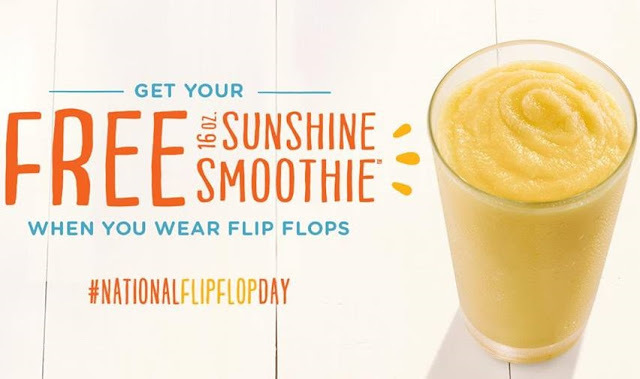 Anyone wearing flip flops at a Tropical Smoothie Cafe on National Flip Flop Day will receive a FREE Sunshine Smoothie in a new, limited edition 16 oz. 20th anniversary souvenir cup from 2 p.m. to 7 p.m. on Friday, June 16, 2017. To get your free smoothie for wearing flip flops at a Tropical Smoothie Cafe located near you, use the store locator here.